Sheer fabrics in tablecloths, chair jackets or ties more popular than ever—they add just a touch of visual interest to your event and can be used alone or in combination with nearly any found fabric. 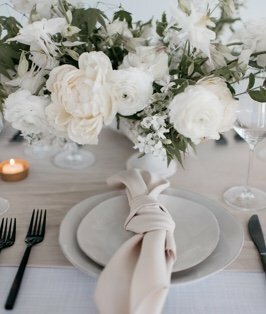 In the case of our Wisteria Bella Sheer, you’ll find endless ways to pair this with the rest of our table and chair covers. So what do you want to do? Leave the Wisteria Bella Sheer by itself as a minimalist piece of décor? Use to for an elegant, sophisticated wedding? The choice is yours, and we welcome you to use our Virtual Design Center to help you make this decision.